The Florida Panthers have named Bob Boughner as their new head coach. 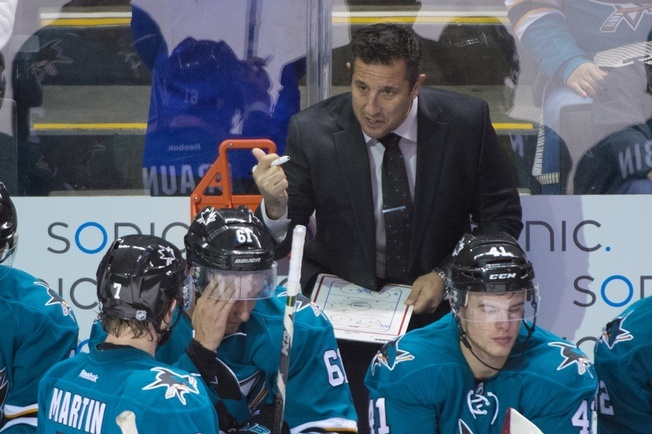 The 46-year-old had served as an assistant coach with the San Jose Sharks for the previous two seasons. The Sharks reached the post-season twice in that timeframe and made it to the Stanley Cup Final in 2016, where they were defeated by the Pittsburgh Penguins. Boughner got his NHL coaching start with the Columbus Blue Jackets, where he served as an assistant coach starting in 2010-2011. He was head coach of the Windsor Spitfires for eight seasons and won consecutive Memorial Cups in 2009 and 2010. He was named the OHL and CHL coach of the year in 2007-2008 and 2008-2009 and was part of an ownership group to buy the Spitfires in 2006. Boughner served as the organization’s president and the club has won three Memorial Cups under his leadership. The new Florida bench boss has experience coaching the likes of Nashville’s Ryan Ellis and New Jersey’s Taylor Hall. Boughner also saw time in the NHL as a player for 10 years, starting in 1996. He played in 630 games with the Buffalo Sabres, Nashville Predators, Pittsburgh Penguins, Calgary Flames, Carolina Hurricanes, and Colorado Avalanche. He was drafted into the NHL by the Detroit Red Wings in 1989 and actually spent some time in the Panthers’ organization, where he skated with their IHL affiliate in Cincinnati and their AHL affiliate in Carolina. The Panthers have been looking for a coach since April, when they canned interim head coach Tom Rowe after he took over from Gerard Gallant early in the season. Tallon subsequently moved back to his duties as a GM and Florida was ready to head in a new direction. The 2016-2017 regular season was a painful one for Panthers fans. They finished 14 points outside of a playoff spot after enjoying a nice uptick in fortunes the previous year. Interestingly, Boughner is only a little older than free agent Jaromir Jagr, who may be returning to Florida for another season. Boughner is the 15th coach for the Panthers in 23 years and the fifth coach for the Panthers since 2011. Obviously, the club would like to stop the revolving door and get some consistency and they’re hoping he’s their man. If not, it’s back to the drawing board. Again.